Blend the sea lettuce with the water and cucumber juice. Filter through a fine strainer, heat it gently and add the previously rehydrated edible gelatine. Pour the mixture into a tray to obtain 12 cylinders measuring 1 cm in diameter by 0.5 cm high. Set the mixture in the fridge and freeze before cutting it. Chop the dill, add the salt and sugar and leave the mixture to marinate for 6 hours in the fridge. 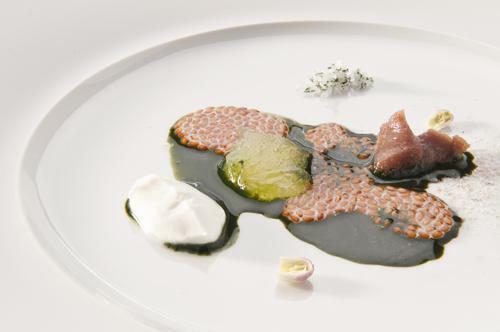 Place the cress mucilage on 4 plates with the lemon flower petals, the yoghurt flavoured with a drop of lemon juice, the caviar, the salt and sugar marinade and the dill juice, ending with the smoked sugar grated when serving. * For the cress mucilage: place 100 g of cress seeds to soak with 400 g of water the night before. The following day you will have a jellylike consistency. • For the smoked sugar: place the sugar cubes in a smoking machine. Repeat the operation 5-6 times.